Can I play baccarat on my phone? Whether you are an Apple addict or an Android aficionado, you can play baccarat on your smartphone device. We detail how you can carry your phone around and play a game or two of baccarat with real money, as well as the best smartphone casino to visit and play the popular title. Online baccarat titles haven’t been optimised for the mobile platform nearly as much as blackjack and roulette titles have been, and therefore it can be quite difficult to locate one to play on your smartphone. We aren’t quite sure why this is the case. However, there are a handful of digital punto banco variants that have surfaced at trusted mobile casinos in recent times. Baccpo is a unique baccarat variant available on the Odobo Platform. It has been created by Applejack Gaming, who are HTML5 gaming pioneers. The title is a hybrid of baccarat and blackjack – an excellent option for mobile players who like both games – where the players verse the dealer with three hands in play beating the house with a hand closest to nine. There is also a side bet option available, and no chance of going bust. Another mobile baccarat title created by Applejack Gaming and launched on the Odobo platform is Baccarat Star. This option is perfect for players after a traditional version of baccarat on their portable device, with elegant graphics and classic gameplay featuring a two or three card hand closest to nine winning. Baccarat Star also offers the Banker, Player and Tie bets, as well as two bonus bets. Created by the mobile casino game pioneers, Play’n Go, this title is another traditional baccarat option featuring a standard baccarat table. There’s a handy help screen to track your baccarat scores and explain all the rules and the additional bets of Banker Pair, Player Pair and Natural. This is quite possibly the best feature to hit the world’s top mobile casinos in recent years. Trusted operators such as Guts, Jackpot City and Thrills offer an extensive live dealer catalogue for smartphones and tablets. This means you can carry your phone around and have your very own human dealer streamed in HD to your device’s screen. Players simply tap in their bets and watch in real time as the results are determined by a professionally trained croupier who deals according to traditional punto banco drawing rules. 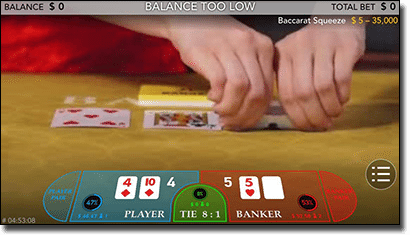 Evolution Gaming powers the two baccarat titles available for smartphones, including Live Dealer Baccarat and Live Dealer Baccarat Squeeze. The only difference between the titles is the inception of a card peek in the Squeeze version. All players can view the card peek and the cards which are squeezed (Banker or Player) are determined by the cumulative bets at the table. This does slow the game down a bit, so if you want a faster version opt for the standard live dealer baccarat title for mobile devices. If these titles sound good to you, you will need to sign up to Guts Casino by tapping the links on your Android, Apple, or even Windows device and make a deposit to get playing with real money, especially if you want to play the live dealer baccarat titles (these can only be played with real cash bets). Simply tap the ‘Deposit’ icon in the top right hand corner of your phone and pick from Visa, MasterCard, Neteller, Skrill, or Paysafecard to make a secure deposit. Enter the amount you wish to deposit, follow the prompts and confirm the transaction to have your funds appear in your mobile casino account immediately. These funds will be available to access on both mobile and desktop devices, irrespective of what you made the deposit on. You can then get playing real money baccarat on your phone.